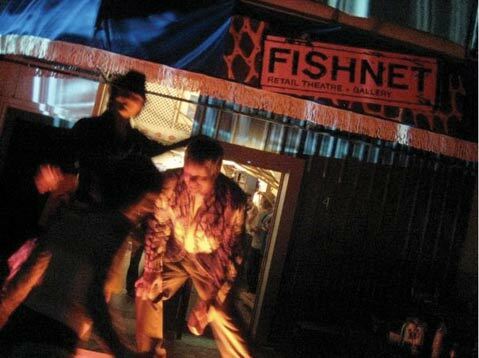 Fishnet Retail Theater brings unusual art to the mainstream. Deep in the Funk Zone, yet so close to the beach you can see the ocean from the street out front, Fishnet, a new artists’ collective and store at 46 Helena Street, aims at nothing less than changing the way people think about and experience art. A spinoff from the radical art community Fishbon, Fishnet first opened its doors on Saturday, July 4, with a spectacular street festival that included a fashion show, large-scale outdoor video projections, music, fire performers, and an incredible view of the city’s fireworks celebration. Since then, the space has settled into a groove, with weekly hours of noon to 8 on Fridays and Saturdays and noon to 6 on Sundays and biweekly Thursday-night “process events.” A Fishnet process event is a cross between a party, an art opening, and a multimedia creative workshop through which visitors can learn about the process of the featured artist, get to know the Fishnet community, and perhaps even make some art of their own. Fishnet catalyst Clay Bodine said that what his group is after is “something closer to relationship art than to the dominant mainstream model of a highly stratified art world controlled by dealers and designed to separate consumers from creators.” Fishnet associate Corinna Gordon calls what they are doing “curating the audience,” meaning that, for Fishnet participants, the artist’s connection to the community moment is always the top priority. The resulting work runs the gamut from the playful improvisation of graffiti-inspired wall murals to amazing, technically advanced digital paintings, such as those on display at Fishnet right now by painter and sometime Hollywood production designer Mark Goerner. Goerner has earned a reputation for being able to create convincing alternative realities on his computer. After he sketches these elaborate images, the heavy lifters of the film industry’s major prop companies move in to make his pictures come to life. In the near future, Fishnet is set to expand its operations with such open-ended ideas as a Sunday puppet playhouse, where visitors will be able to create and then perform with their own puppets. For more info, call 453-5246 or visit thefishnetstore.com.